The Westney Stationary Living Room Group by Best Home Furnishings at Best Home Furnishings in the St. Louis, Chesterfield, St. Charles, MO & Waterloo, Belleville, Edwardsville, IL area. Product availability may vary. Contact us for the most current availability on this product. 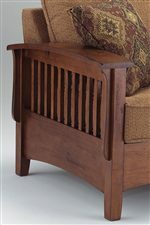 Arm Type Exposed wood arm, finished in distressed Pecan curves and has slats the connect the arm piece to the legs.